Alfred Hitchcock on What's My Line? Since he's back in the headlines again, due to the frustrating HBO film "The Girl," (and on my mind since I just wrote a chapter about Hitch for a book on San Francisco films), thought this "What's My Line?" clip was amusing--especially the concept that this was not an easy person to guess. This is a sobering but important article on the reality of submitting TV scripts written by Chad Gerwich for Script Magazine that folks on Twitter's #tvwriterchat and others among you who are trying to get your spec TV scripts read and even sold. In our book Show Me The Funny! : At the Writers Table With Hollywood's Top Comedy Writers, twenty-seven comedy writers take a generic premise we gave them and develop it into twenty-two unique stories. An unexpected bonus is some great pitch stories that emerged during these interviews. Both screenwriters and sitcom writers from the golden age of TV to Everybody Loves Raymond talked about their experiences with producers and executives. That gave us the idea of writing a pitch book. We called in two friends: a writer/director with forty movies to his credit who has spent time on both sides of the desk and a producer who has two Oscars to her credit. The four of us started spit-balling. Within twenty minutes we heard that a competent producer “can smell a good story regardless of how it's presented.” Then we heard: “The story isn't that important. It's the enthusiasm of the person making the pitch.” The same person made both statements…our award-winning producer. This double message showed us why so many people go into pitch meetings with shaking knees, sweaty hands and pounding hearts. We decided we could be much more helpful talking about how to handle the stage fright that emerges whenever even the most experienced and successful writers pitch. Stage Fright? What is it good for? Stage fright can actually be useful if you can convert it into excitement. Too much of it can be devastating, but it can motivate you to practice. To kick that off, here's one tip to help you project enthusiasm. 1. Go over your idea or script and make sure it's good enough to merit your enthusiasm. It's important that you think it's great. 2. Take a stab at this classic acting exercise: practice pitching over-the-top; do it with wildly exaggerated enthusiasm. Go for a cartoony effect to get in touch with the most extreme enthusiasm you can create. (Make sure you're alone when you do this.) Next, look for something within that crazy, out-of-control pitch and find an element in it that resonates with you. Try it again, only this time, dial it down to a level you feel comfortable pitching with. 3. Use a camcorder to record yourself. Tinker with the presentation until you're happy with the results. 4. When you're ready, try the pitch out on a few discerning friends who will give you honest and knowledgeable feedback. 5. Find some other more extreme friends to help you simulate a pitch going very wrong. Ask them to push even beyond that point. Tell them they can't hurt your feelings. Remind them that you're a writer and you have no feelings left. We were struck by the level of enthusiasm Cinco Paul and Ken Daurio (Dinner for Schmucks, The Santa Clause 2, Bubble Boy), one of the writing teams we interviewed, generated during their pitch. As they were developing a story their enthusiasm for what they were creating grew exponentially. Soon they were finishing one another's sentences and feeding off each other's energy and ideas. If you find this useful, we'll be happy to provide many more tips to battle “Pitch Panic.” Come to our web site Show Me the Funny! [or www.smtfo.com]. And, hey while you're at it 'Like' us on Facebook. One out of every 150 people in America bought a copy of a joke book that Peter Desberg has written. Unfortunately, Scholastic sold the most popular one for $1 each, so he still has to work. Counting his five joke books, he has had twenty books published. In addition to this lucrative writing career, he is a licensed clinical psychologist who specializes in the area of stage fright. He has worked with many top stand-up comedians, who are regularly confronted with massive cases of flop sweat. He also has been moonlighting as a full professor at California State University Dominguez Hills for over thirty years. Jeffrey Davis's earliest memories are of sitting around the writers' table at Nate & Al's Delicatessen, where his father and his comedy writer cronies gathered over corn beef and Doctor Brown's Cream Soda, told war stories, and tried to fix third acts. He began his own career writing jokes for Thicke of the Night. Among his situation comedy credits are Love Boat, House Calls with Lynn Redgrave, Give Me a Break, Diff'rent Strokes, and Night Court. He has also written for such shows as America's Funniest People, America's Funniest Home Videos, and Small Wonder, and has had film projects developed by Bette Midler's All Girl Productions, among others. His plays have been produced in New York and Los Angeles. His most recently published play is Speed Dating 101. He is the Screenwriting Department Chair and associate professor of film and TV writing at Loyola Marymount University. His one night of stand-up at the Comedy Store convinced him that he should stay permanently seated at his desk. ABC's new cop drama looks shaky to me, at least based on what I've seen of it. Sample quote: "Aaaarrrrrgggggggghhhhhhh." copyright: me, and hoping no one sues me. Found this in a recycling bin outside Bad Robot Productions. "Notes to the Writers on How to Write a Final Season Episode of LOST"
- Keep in mind the theme of Deja Vu. - When stuck as to where you are, have one character (i.e., Jack or Illana) tell another that they have to get moving. / And then make sure there is at least one scene with several characters hiking from one part of the island to another. - Hint at a mystical/mythical God vs. the Devil connection but if hinting doesn't work you may bludgeon people over the head with the connection. But: only in moderation! Interview with Aaron Paul of Breaking Bad. Congratulations on getting the Emmy nomination. Has that lead to other offers down the road, other films or series – how has that changed things for you? As of right now I’ve been getting so many amazing congratulatory phone calls from people I haven’t heard from for ages. But otherwise as of right now nothing’s really changed. My life’s been turned upside down by all this attention. I was not expecting this at all. Just to be on a show that I’m so unbelievably proud of, I really consider everyone a part of it like a family to me, so to see the show recognized is such an honor. You and Bryan [Cranston] have such great chemistry together, how has working with him rubbed off on you as an actor? Just being around Bryan just makes me a better person because he’s the kindest man probably the funniest guy I’ve ever met in my entire life. But working opposite him, everything he does is so honest and genuine, it’s not forced. Working with someone like that, as an actor, makes me a much better actor, he’s taught me a lot of things. How do you think your character, Jesse, himself changed from season 1 to 2 --? Season 1 didn’t really have a lot of room for – we saw some character arc but season 2 delved in for every character involved much more character development. We saw much more where Jesse was coming from. 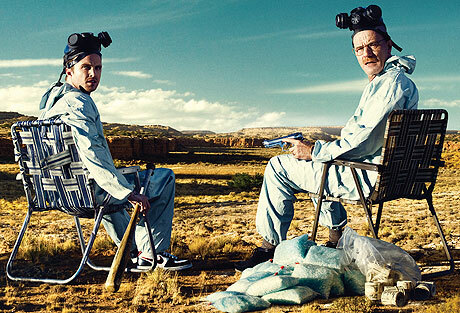 And season 2 compared to S1, Jesse wasn’t as much a fan of Walter White [Cranston’s character] at the beginning of the series but he’s grown very fond of Walter, he truly believes he’s an artist. The buddy angle really works for the story and won’t ever really go away – that Odd Couple relationship that Jesse and White have. But Jesse in Season 2 has just been constantly beaten down, anything that could go wrong goes wrong. So he grows a tougher skin, a harder shell. And who knows what happens with Season 3. I read that your character wasn’t originally going to even make it to Season 2, is that right? Yeah, originally – this is when Vince Gilligan, our amazing show runner, was pitching the arc of the first season to AMC, and at the end Jesse was to meet his demise. And after we shot the pilot, they really liked the chemistry between these two characters. When Bryan and I were on screen, we just battled it out and they loved that dynamic. Once it got picked up they changed that. I didn’t know about that at the time but I’m so glad they didn’t do that. So many pilots in my career that never got picked up [for a series] and then finally one gets picked up that I’m so unbelievably passionate about, that I would’ve been just devastated if they killed me. So now I’m like panicked. He reassured me, “No, no, you don’t understand -- Jesse is not gonna die anymore.” Ever since that moment it’s been so funny because everybody teases me. “Yeah man you’re not gonna make it past the second episode of the third season.” One of the producers last year, Karen Moore, took me aside and was like, “Really quick – how tall are you exactly?” “I don’t know, 5’8 ½ depending on the time of day.” “Okay well we need the specific measurements. We’re getting the casket made for Jesse.” Oh man. Those stories are always getting played on me because they know how freaked out I was. But Vince says I’ll be around for awhile. Do you have any input on your character as far as what happens to him in future scripts? Not really, I don’t know what’s happening with Season 3. They keep it under wraps. They’re totally open as far as suggestions and ideas, things they might play with. But the writers do such a great job with what they’re doing, I’m happy to leave it up to them, they’re the ones molding this magic so I leave it in their court. But going into season 3 I know that Jesse will be in recovery obviously from losing the love of his life, he’s never really had that kind of relationship before, and she was taken away. And at the end of season 2 he was dragged by Walt out of that crack house and into a rehab facility. So that’s where we’ll start off. Jesse and the rehab, and dealing with his grief and emotions. So who knows if Jesse will stay clean and keep his head on straight, but I’m excited about finding out. How do you prepare for some of the physical abuse and punishment that your character has to go through? With the physical stuff, wearing knee pads really helps, but with the emotional aspect I just try to make it as human as possible so I can get to that point of emotion, so that it feels like I myself am going through what Jesse is. With the drug use, I got addicted to the show Intervention, and YouTube, watching documentaries online. I didn’t know the effects of heroin the first time you use it, how your speech is, whether it slows down or speeds up. From my research I found your speech slows down and you’re in your own world. So I did as much research as possible. Watching Intervention is tough because you’re seeing what it does to the families too. And at a certain point, that’s what’s so horrible about these drugs we’re dealing with on the show – in the first season we were dealing with the effects of meth, but in second season it kind of bled into the whole heroin aspect. At a certain point the user doesn’t have control of the drug anymore, the drug has 100% control of them. It’s not even really their fault at that point. So they end up needing other people to come in and help them because if they don’t have that, then they’re lost. At a certain point they can’t do it, they need other people’s help. That’s what’s so devastating about watching Intervention, some of the shows have happy endings but a lot of them don’t, just like life. Do you get feedback from former drug users? The greatest compliments I get are from [those] people – [the show] is almost their fix, rather than using. And the show does not glamorize crystal meth by any means. But then on the other end of the spectrum I get, “Hey so do you got any hookups, get me some blue meth?” “No I absolutely cannot.” It’s disturbing, but I guess it’s like a compliment to the show in a weird way. Getting back to the Emmy nomination, do you get any feedback, or how would you yourself assess it as far as whether you did anything special or different to get you the nomination? Yeah, I think the second season really hit its stride more and there was much more character development. I guess what was happening in that season, there were more levels of emotion with Jesse, more that he went through, I think that’s what people saw and that’s what people noticed. It’s all so surreal. I moved down to Los Angeles about 12.5 years ago and went through ups and downs, the rollercoaster of emotions, from great jobs to the kind of jobs that I didn’t really want to but I kind of had to do to survive. But I’m finally doing a job that I’m so unbelievably passionate about, to be in this [Emmy] category with an unbelievable group of people – William Hurt, are you kidding me? Michael Emerson – I’m the biggest Lost fan. Separated at Birth? Violet and April. I hope they don't take this down, but while it's up there... here's one of my favorite Mystery Science Theater segments, a priceless parody of Ingmar Bergman, ya shore you betcha.